Vsauce asks an interesting question, will we ever run out of new music? James Grier is a Canadian musicologist who has spent a great deal of time researching in the notation room at the Bibliothèque nationale in France. While there a colleague asked him to look at a 900 year old manuscript. 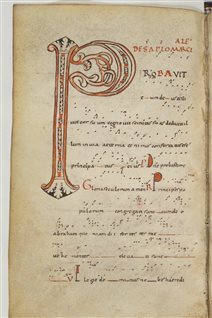 What is unique is that Adémar’s had placed the notes in the space above the text, higher or lower in the space depending on their pitch, exactly as we do today. Thus this is the earliest, and perhaps even the very first time this had been done. Read more about this historic discovery and listen to a report about it here at the Royal Canada International web site.